Founders of New Earth Cafe/Wellness store and New Earth Metta centre on the Sunshine Coast, husband and wife team Ben and Sarah share a passion for self development. Through raw food, nutrition, sound therapy, yoga and meditation they have gone from surviving to thriving and hope to empower others to do the same. Dubarray have composed an album that contributes to a live yoga musical experience: is the collaboration of yoga with ambient sound bathing live music that brings a deep sense of connection. Yoga flow is by Sarah Parsons. Use the power of the most effective sound-healing tool in the world – the voice! Nourishing the body with subtle organic vibrations also known as the ‘hum affect’ we feel into the positive shifts within the body, toning to certain frequencies and rhythms that promote a meditative state. 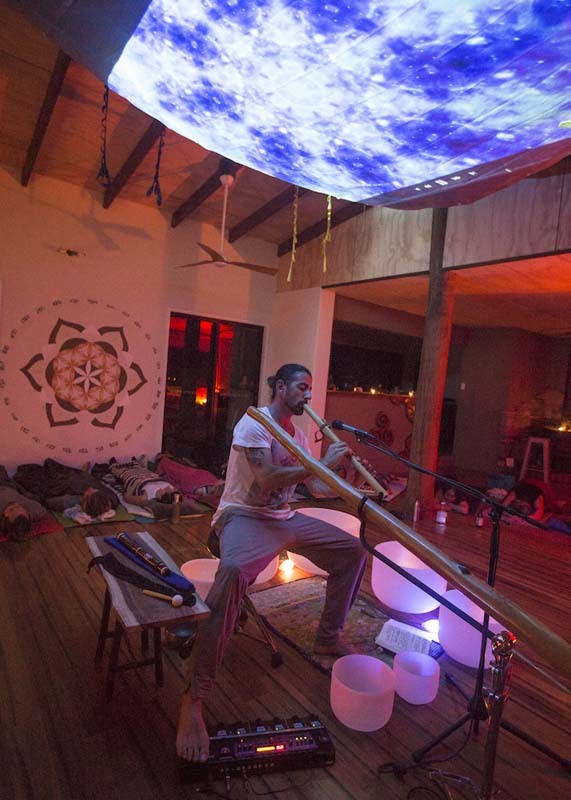 The sounds of Quartz crystal bowls, Yidaki (didgeridoo), Tibetan bowls, Native American flute and vocal sanskrit chanting create a space that helps quiet the mind, allowing the subtle overtones to work their magic, restoring mental, physical and emotional harmony. Health coach and raw food chef Sarah (from New Earth Metta) will share delicious savoury recipes that help you rebuild, so you can begin to thrive and feel the magic of plant foods working. Life is busy and it’s so easy to eat the same 20 ingredients over and over, making the same meals and absorbing the same nutrients. Learn how to diversify your diet.